So, I just happened to stumble upon this little pet supply and nursery store on Alamo Drive in Vacaville, California. The staff was quite friendly and welcoming. 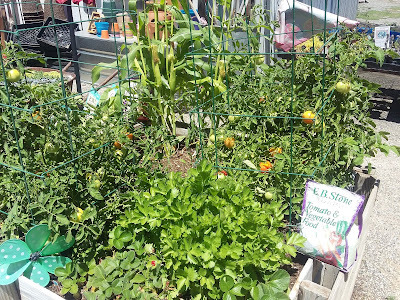 I walked in and took a few pictures that made me continue to look forward to when my tomatoes are ripe. Enjoy! 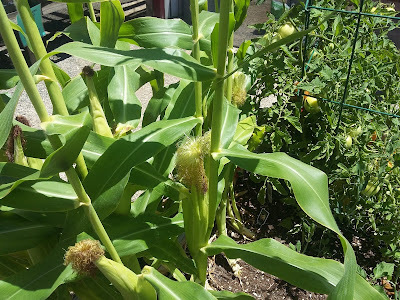 This dwarf sweet corn is quite cute. 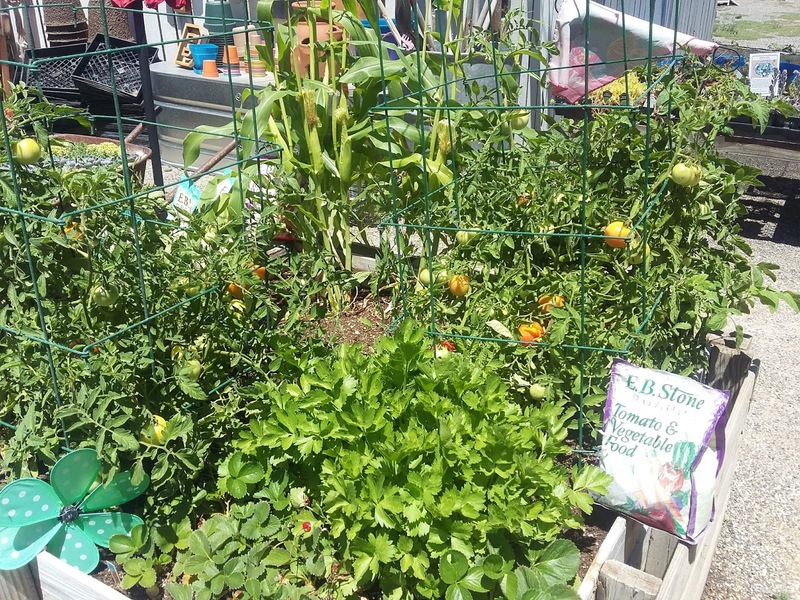 One more view of the cute garden display. 1. Using your eyes: Watch the fruit color. As it ripens, the color of the carosello fruit changes. While still on the vine, I notice that the green color fades away and is replaced by white, yellow or other faded colors. Tondo Barese - Unripe for eating, White and ripe for seed saving. 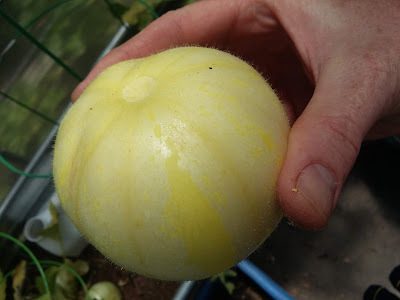 This Tondo Barese turned from green to yellow when ripe. 2. Be patient: If possible, leave the fruit on the vine until it slips off. Not all plants are left alone by insect pests or other factors that allow it to live to fully develop the fruit. Though this can be frustrating, if even this fruit is left on a little longer to develop seed then the seed may be able to be preserved. 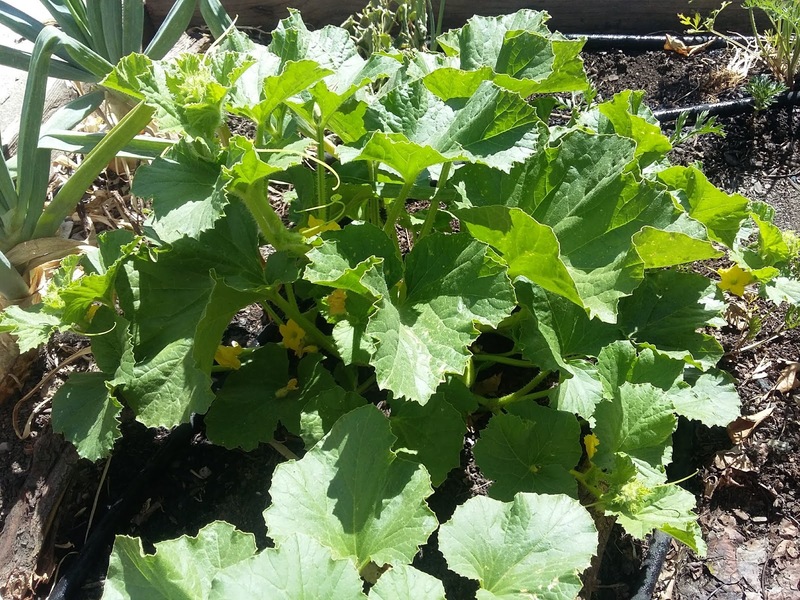 If a disease part of the plant, it can be cut off to let the fruit continue to develop. 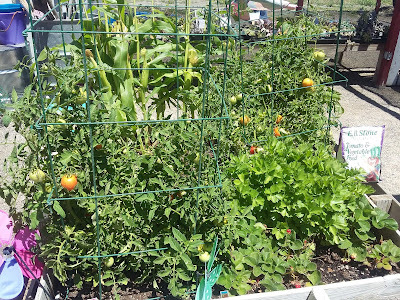 Any disease that can be transmitted requires immediate disposal of the plant, but I have had very little problems with this when compared with tomatoes. Ideally, leave the fruit on the vine until the fruit slips off the vine or when the plant no longer supplies energy to the fruit such as when the vine dies of old age. 3. Breathe it in: Along with the fruit slipping off the vine, you should also begin to smell a sweet fragrant melon smell. This is indicating that the fruit is becoming ripe. Even if you don't smell this, sometimes the smell will develop while the fruit is in storage. 4. Storage: Leave the fruit in a dry cool place. If you have a lot of fruit in one place, check each daily to ensure they are in good condition. I love the smell of the ripening fruit. 5. Is it Ready yet? Press each ripening fruit. As the seeds mature, they continue to feed off of the fruit until the fruit begins to deteriorate. The main indicator that the fruit is deteriorating is that the fruit does not maintain its form when pressed by the fingers. Gently, but firmly, press the ripe fruit. Does it go back to its original shape or does the flesh become indented with your fingerprint? Sometimes you can also determine the amount of deterioration in the fruit shaking the fruit. If the fruit makes a slushing sound as you shake it, then the fruit is definitely ripe. Slushing means the seeds need to be harvested right away before they begin to sprout. 6. 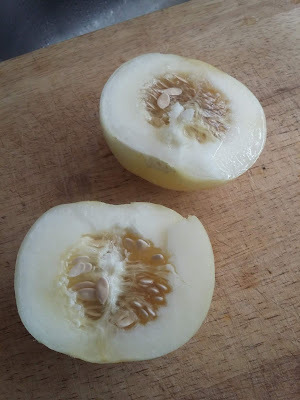 Cutting and Rinsing: Once I have a soft fragrant fruit, then I harvest the seeds by cutting just far enough into the fruit to cut to where the seeds are. 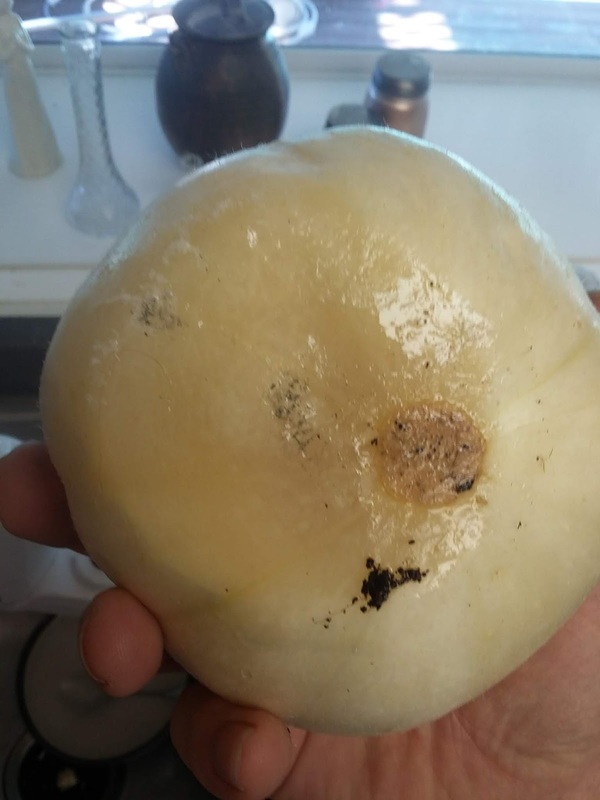 I cut all the way around revealing a dome, each with a cavity of seeds. I scoop out the seeds with a spoon. If I time it right, the seeds have had as much time as possible to develop into viable strong seeds, but have not been kept in the fruit too long so that they begin to sprout. Rinse them with water in a colander and put them on a plate to dry. Notice the pulp is mostly broken down already. The coating around the seed should be gone and the pulp should easily separate. 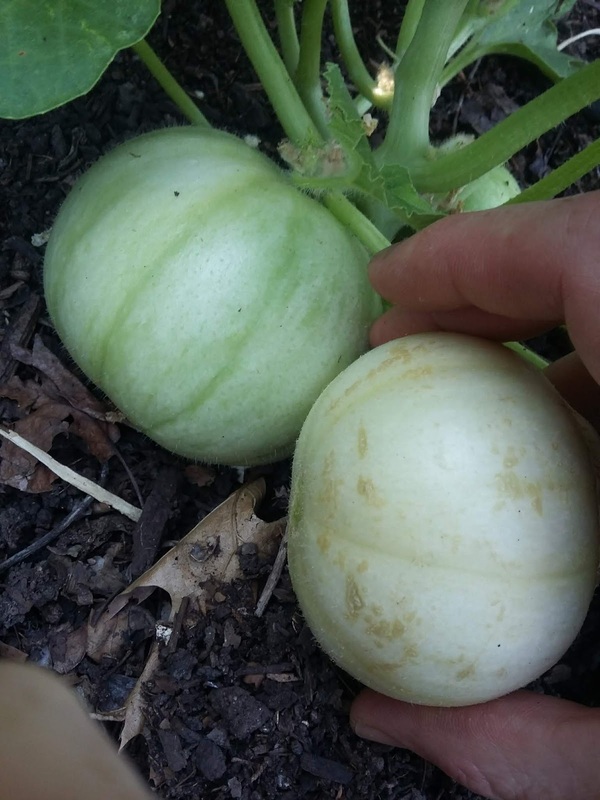 Though the yellow fruit has less seeds (left), the seeds on the left were better pollinated. 7. 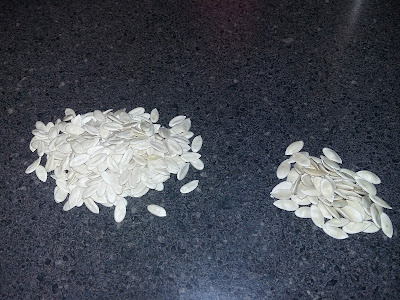 Winnowing and sorting: Once the seeds are dry, I often find that 30-60% are not of a high enough quality to keep. 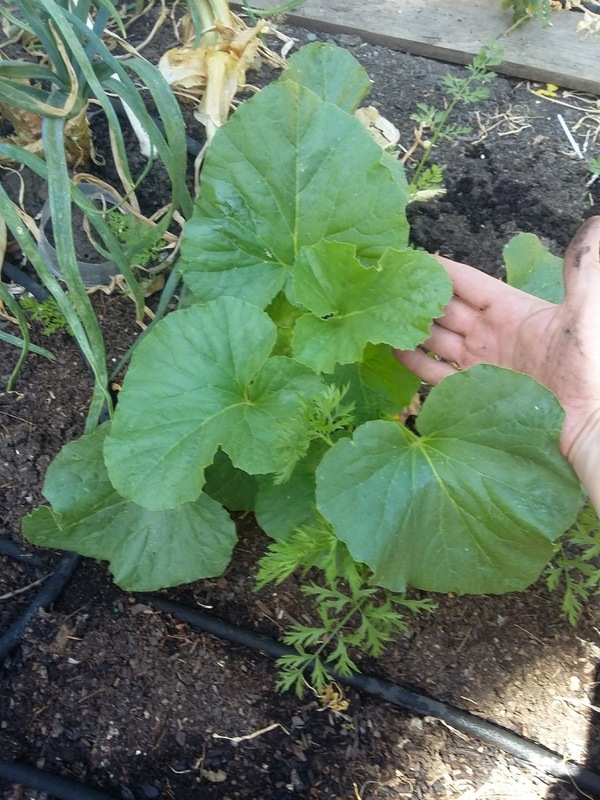 I winnow the seed by using a fan, the outside wind or by just gently blowing on dried loose seed. The light and thin seed will move away from the rest and separate from the original seed while the heavier thicker seed will remain. 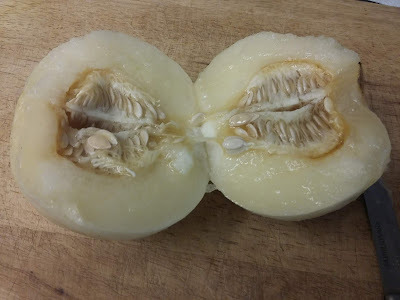 I then remove any strange looking seed that is humpbacked or deformed. 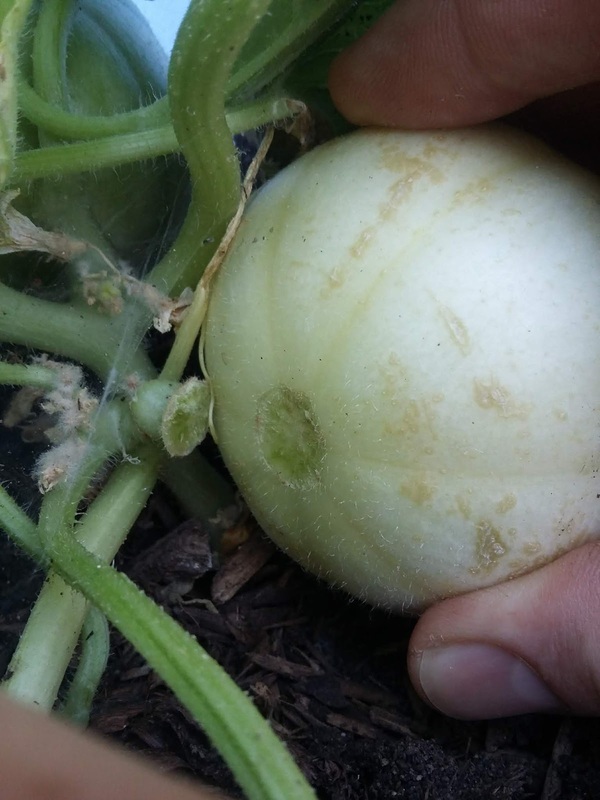 Fruit that is poorly pollinated or is not allowed to ripen completely will produce less viable seed. 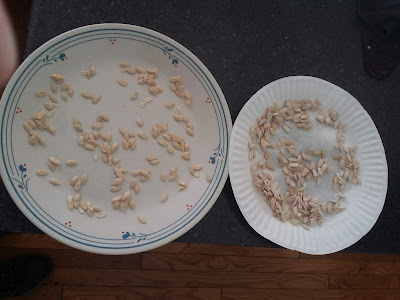 Pictured below are two piles of seed from a carosello that was poorly pollinated in a greenhouse. Seed Storage: The remainder of the seed should be kept for long-term storage in a cool dry place. Though I previously advocated freezing seed, the drying process involved can often lead to seed mortality (over-drying). Currently, I am refrigerating much of my seed, though still considering some seed for longer-term use. Your experiences are welcome: If you have saved Carosello seed in the past, tell me your experience and let me know what I may be missing from my little guide here. Here are a few recent pictures of a couple of my outdoor Tondo Barese carosello. 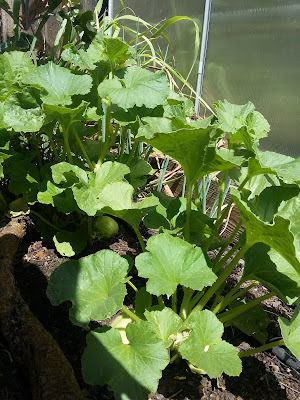 As stated earlier, I have been growing some Tondo Barese in my greenhouse. I sent these pictures to my friend, Giuseppe who is writing a post about them at his blog. 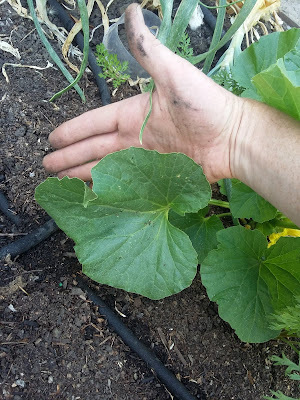 It took a couple times of me putting out transplants to finally remember to harden the plants off. I probably wasted a month of growing time making this mistake. Don’t follow my example. Allow plants that have been protected at least a week of hardening off before transplanting. 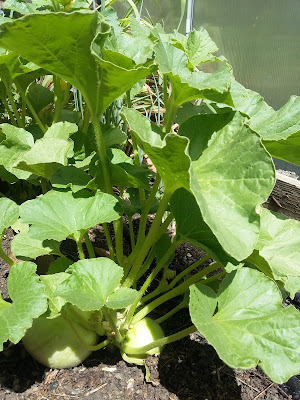 I have found that cucumbers and melons are especially sensitive to transplant shock. As stated earlier, my best results have been with pre-sprouting. Once the soil warms up the plants grow very quickly. This year I added some powdered basalt to my soil to counteract how much nutrients my tomatoes took from my soil last year. I picked it up from LeBallister's Seed, which sells soil amendments to large vineyards and retail customers at wholesale prices. The results so far have been very good. I hope that the rest of your growing season is both fruitful and productive. Last, but not least - if any of you are interested in seeing a very amateur video I made of the Tondo Barese, you may do so here. For a while now, I have been trying to figure out two different situations that have posed a dilemma in my backyard. The first was what to do with the 50-gallon water jugs that I have been filling up with water from heating up the shower. The second was how to water the plants in my greenhouse. Initially, I thought of just filling watering cans with very small holes. This option works alright for the short run, but required frequent attention. Another option I had considered was to have the watering system drip-feed some water emitters. 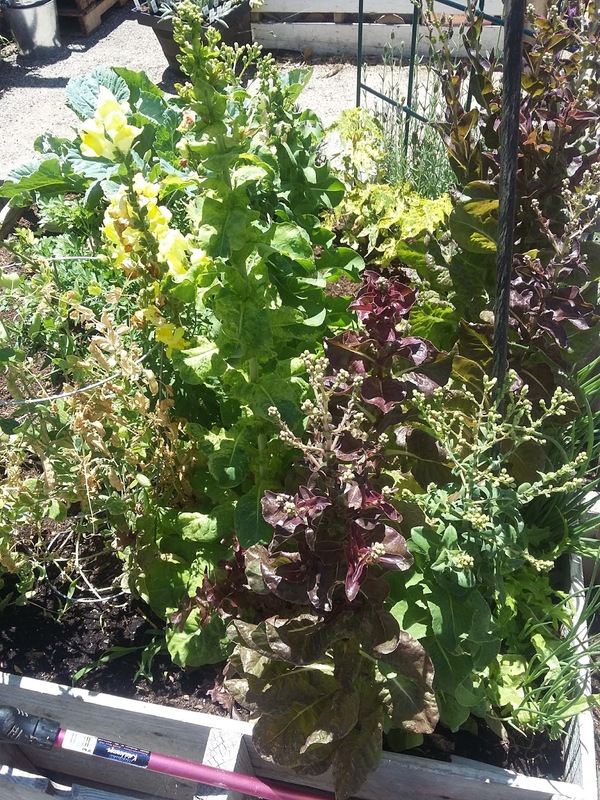 The problem with this is that the flow would not always match the needs of the plants. After looking for quite a while for a viable solution, I found the olla to be a very good option. Instructions for assembly - Don't take the exact order literally! The in-line filter (not included) that I purchased to go with the system. Ollas (pronounced oy-yah) are porous terracotta containers that can be filled and let water out slowly. They discharge water slowly, leaving the soil moist, but not wet. The roots of the plants surround the olla and grow well. The only one I could find to buy that would work with a drip line was the EasiOyYa, which can be purchased online. It includes everything you need for the system other than a water barrel. There is a small in-line filter, which keeps debris out of the line. That being said, I purchased a sturdier in-line filter to ensure that no particulates get into the Ollas. All ready to hook to the line. Water at the end of line indicates it is working. The EasiOyYa was incredibly easy to put together and get working. 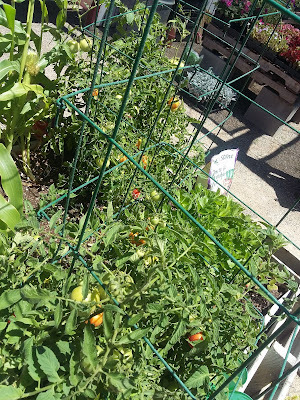 Once I got the Ollas ready, I placed them where I wanted them and left plenty of extra drip irrigation line so that if I needed to move them, I would be able to do so easily. To get the whole thing started, I hooked everything up, except for the drip line to the water barrel. Then I left the fitting for the end of the line open and hooked the whole system to a hose. I turned the hose on only a small amount and waited about 10 minutes until the water went all the way through the system to the end fitting. I then closed the end fitting, turned off the hose and hooked the whole system to the barrel and turned the spigot on the bucket to reestablish water pressure. My carosello plants quickly grew and the fruit ballooned. The only drawback of putting in the EasiOyYa was that I put it in near the surface of the ground. By doing so, I attracted some fungus gnats, which began to feed on the roots of my plants. The fungus gnats may be in the greenhouse for a while, though I was able to move the Ollas deeper into the ground (remember how I had added extra drip line to each section). When I took each Olla out it was surrounded by roots. The plants did not appreciate this change, but eventually adjusted. The gnats on the other hand seemed to have gotten the point because I haven’t seen many since. After the Ollas had been in for about a week. Overall, I would definitely recommend an olla system to anyone. Especially anyone who has a hard-to-irrigate location and prefers not to babysit their plants. Here is a little video of my EasiOyYa in my greenhouse.